[f]ifty years ago, the unemployment rate was 5 percent for whites and 10.9 percent for blacks, according to the Economic Policy Institute. Today, it is 6.6 percent for whites and 12.6 percent for blacks. Over the past 30 years, the average white family has gone from having five times as much wealth as the average black family to 61 / 2 times, according to the Urban Institute. “If you look at 50 years after the 1960s civil rights movement, the most stubborn and persistent challenge when it comes to the nation’s racial challenge remains in the areas of economics and wealth,” said Marc Morial, president of the National Urban League. That’s unquestionably true, and yet, these sweeping analyses risk overlooking some important evidence right there in the data that Dr. King would have recognized as entirely consistent with where he was trying to take the movement when his life was so tragically cut short. It’s about full employment, something I go on about a lot around here. Remember, it was called the “March on Washington for Jobs and Freedom” (my bold). And when he was taken from us, Dr. King was leading the “Poor People’s Campaign,” organized around the need for jobs, health care, and housing. The last time this economy was operating with truly tight labor markets, back in the latter 1990s, I was quite struck by the gains made by African-Americans, both in absolute terms and relative to whites. Here’s just a small table, the work of a few minutes, which makes the case on a number of key economic variables. –Between 1993 and 2000, the national unemployment rate fell from 6.9% to 4%, a decline of about three percentage points (ppts). But African-American unemployment fell 5.4 ppts, about twice the decline of white unemployment. –Employment rates—the share of the working-age population with a job—went up 5.5 points for blacks and 2.2 for whites. –The poverty rates of black families with kids fell a whopping 14 ppts over those years, close to four times the 4 point decline for white families. 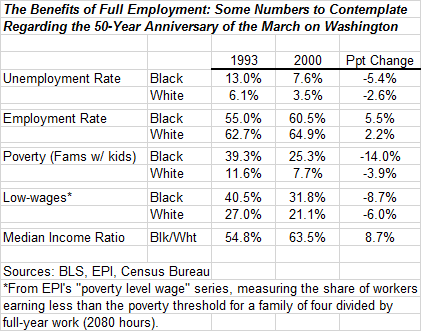 It’s also true that 2000 marked an all-time low in the poverty rates for blacks. –The ratio of black median income to that of whites rose almost 9 ppts to its highest level on record going back to 1947. These statistics focus on the relative trends, but it is of course disarmingly clear that the levels in the table reveal great racial disparities. Even with the noted gains, black family poverty was many multiples of the rate for whites. Even at its peak, the income ratio was below two-thirds. But you’ll never get to the levels you desire without the trends moving in the right directions, and for that to happen, we need to get back to full employment. I never got to meet Dr. King (though I met his eldest son this morning!) but I’ve carefully studied this part of his work, and I’m convinced that towards the end of his life he was operating from the systems principle that if you can’t solve a problem, make it bigger. That is, he recognized not only the role of racial discrimination, but the systematic lack of opportunity facing the disadvantaged in an economy that left large swaths of workers behind. And from his early involvement with the Montgomery bus boycott to his last speech on behalf of Memphis sanitation strikers, King realized the power of the economic leverage as part of the solution. In full employment labor markets, it’s more expensive for employers to discriminate. They risk leaving profit on the table if they’re unwilling to reach more deeply into the unemployed labor pool. I want to be careful not to over-claim: full employment will neither solve everything nor cure the nation of the disease of racial bias. But it will help, and if history is much of a guide, it will help a lot. Addendum: I suspect those of you who are with me are saying, sure, we agree; but how are we gonna get there? Two things re that. First, Dean Baker and I just finished a book on the topic (i.e., it’s with the editor), with an emphasis on the path back to tight labor markets. And second, I’m about to embark on a year-long project that’s all about this goal. It’s exciting stuff, so stay tuned! Share the post "Dr. King, The March on Washington, and Full Employment"
10 comments in reply to "Dr. King, The March on Washington, and Full Employment"
And who was President during the period 1993-2000? It’s no wonder African-Americans vote Democratic overwhelmingly. I completely agree, if everyone had a job many of our problems would be a long way towards solved. 1. Progressive organizations combine on goal: paradigm shift on turnout by angering ordinary voters on voter suppression to achieve record mid-term turnout, with substantive message that all Republicans should be turned out of office (even the so-called “good ones” like Susan Collins who have zero influence) if anything good for the country is going to be accomplished. The President needs to reinforce this goal. 3. Democrats win at least 18 House seats (net), take back House majority, defy Senate odds with three new Senate seats. New filibuster rules plus demoralization from historic losses make future filibuster of substantive economic legislation unlikely. 4. Stunning political victory on full employment theme creates momentum to influence Fed, President to add to emphasis in policy. 5. Very large infrastructure bill passes, promising at least 5 million in new, long-term, high-paying and non-outsourceable jobs, providing with multipliers huge fiscal push towards full employment. (The words “fiscal,” “stimulus” and “multiplier” are never, ever used. 6. Promising employment legislation, large minimum wage increase, ultimate recognition by employees with health insurance that they will no longer risk medical bankruptcy with loss of job with benefits combine to cause huge jump in consumer confidence, reinforcing positive trends. 7 Trend towards full employment, minimum wage increase, pro-labor legislation starts pushing wages up, increasing demand, thereby further lowering unemployment. The virtuous cycle kicks in. The keys, though: (1) total dedication to record turnout in 2014; (2) a believable focus by Democrats with credible details that more than anything else, their attention will be devoted to full employment. It’s a political problem, and there just aren’t enough people getting involved and not enough training coordination for the ones that do. The blogs on the left seem to have a decent size audience; it might be helpful if they pushed that audience to go out and get involved (the many who aren’t already), or discussed more concrete tactics for those that are. Remember, a large part of Dean’s rise to fame was a bunch of bloggers and readers deciding to use Meetup to get together in support of him. There is no single policy that ties everything together as much as does full employment. MLK knew this. His wife Coretta headed up the Full-Employment Action Council after he died. She understood it. My personal role model, Michael Harrington was adamant about it. The organization where I cut my teeth in Washington, Americans for Democratic Action, long considered it the most important goal of economic policy. I can’t tell you how happy I am to hear about the book that you and Dean have written, and that you will be spending a year on the issue. Exciting stuff indeed! The House of Representatives is slated to easily stay in GOP control until at least ’17, which is a problem because the GOP hates federal spending. However, the president could propose a tax cut for incomes under $100k, which would definitely cause employment growth because people would use the money to pay down debt or increase spending. Does whatever is “slated” — by whom, for starters? — have to be the way it goes? Can ordinary Americans be challenged — taunted, even — not to let Republicans use vote-suppression tactics to keep turnout low and give billionaires rather than ordinary Americans the biggest voice in what our elected officials do? Politicians need money and votes. So long as turnout is low, that gives the dominant voice to the ones with the money. An unexpectedly large turnout can change the calculus. The Democrats need the Democratic base to generate turnout. They are the ones with the commitment to knock on doors and make the calls to get people to vote. Please, Mr. President, no more dissing of the most ardent Democrats with stupid and base-demoralizing ideas like cutting Social Security benefits with chained-CPI. (The unpopular Larry Summers presents the same issue.) You can’t keep knocking down the enthusiasm of the workers who get out the vote by taking away their ability to say a vote for a Democrat can actually make a difference. A Republican-lite President does not help them make the case. How could we not have full employment? We have a shortage of low-wage, low-skilled labor according to all the best newspapers and the best brains in Congress. That’s why we need more immigrants and blue cards. Jared, Don’t you read the papers and listen to our betters? The history of Irish discrimination (No Irish Need Apply) shows that increasing the wages (through union organization) for the lowest jobs (56% of Irish immigrants in the mid 19th century were unskilled labor) leads to an improvement in social status, especially for the next generation. Higher minimum wages will mean better homes, better lifestyles and better education, because all these things require money. The problem with poverty is that a job doesn’t take you out of it today. Husband and wife and teen children must all work to satisfy health insurance, car payments, mortgages, taxes, college. It is a hamster treadmill, so you probably need a village all working (at minimum wage? )to raise a child, not a single man or woman. Instead of corporate coddle and conciliate, perhaps we need an effective drive to raise wages and guarantee more than 29 hours a week. This would require government regulation, but would leave us only with the needy and the undeserving, not the workers who cry at night because they can’t afford a new shirt for their first grader, while their employers’ stockholders urge higher dividends for added trips to the Cayman Islands. If one takes the data from the table and computes the gains, relative to the 1993 base, as I just did,one can determine that the PROPORTIONAL GAINS were almost identical for three of the four measures (unemployment rate, poverty rate, and low-wage rate). Only in the case of the employment rate did the gains for black Americans far outstrip the gains for white Americans. And it is the employment rate that has been so badly damaged by the recent Great Recession.